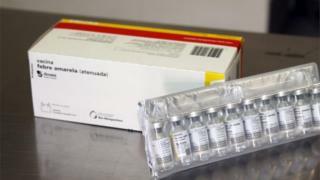 Brazil's health ministry has ordered 11.5 million doses of yellow fever vaccine amid the largest outbreak of the disease in the country since 2000. Seventy cases - including 40 deaths - are confirmed, mostly in rural areas of the state of Minas Gerais. More than 300 cases are under investigation. Vaccinations are being recommended for people travelling to Minas and other areas with confirmed cases. Yellow fever is a potentially fatal disease transmitted by mosquitoes. Most of Brazil is considered at risk from yellow fever but the country has only seen a handful of cases in recent years. Read more: Would it be wrong to eradicate mosquitoes? The governor of Minas Gerais has declared a 180-day state of emergency. Around 5.5 million vaccine doses have already been sent to five states that have confirmed cases or are at risk. The other 6 million ordered will arrive soon. It is not clear what has caused the rise in cases. Jimmy Whitworth, professor of international public health at the London School of Hygiene and Tropical Medicine, said: "It's unusual. "The more cases you have, the more chance that it's going to light up and take off in urban areas." The Brazilian authorities are taking the situation very seriously and appear to have enough vaccine stocks, he added.